The solar-meter Evomex TM 750 detects solar power quickly and easily. The measurement data is displayed in Btu or W/m2. Additionally, the solar-meter Evomex TM 750 provides a Data-Hold-Function, which allows the currently measured solar power data to be frozen on the display of the solar-meter. The advantage of this is that the measuring data can be documented better. The solar-meter runs on merely one AAA battery. 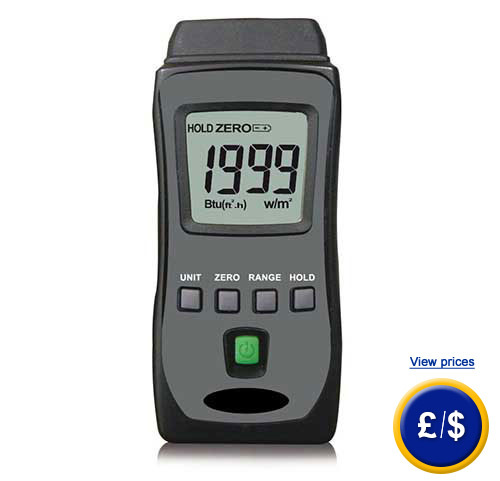 The high sampling rate enables the user to work quickly with the solar-meter Evomex TM 750. Due to a compact design, the solar-meter Evomex TM 750 fits in every toolbox. For further information, please read the following technical data or use our contact form. Our engineers and technicians will gladly advise you regarding the solar-meter Evomex TM 750 or any other product in areas of regulation and control or scales and balances of PCE Deutschland GmbH.